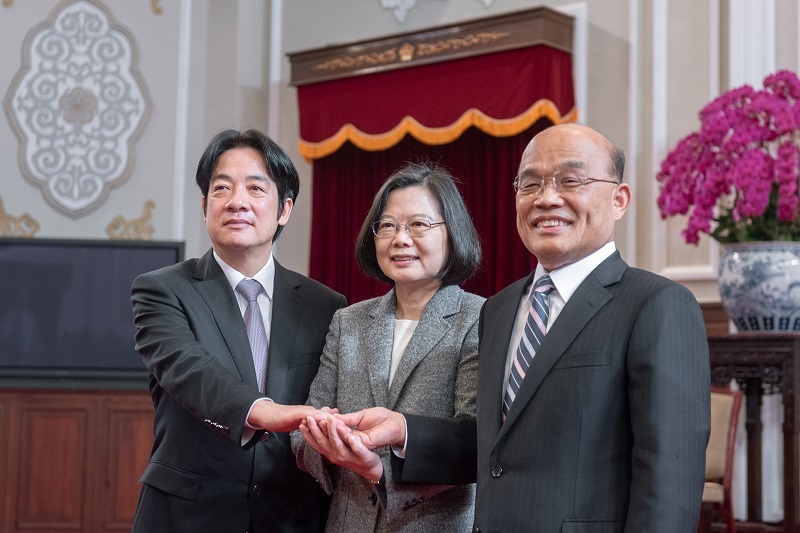 President Tsai Ing-wen named Su Tseng-chang as replacement for outgoing Premier Lai Ching-te during a news conference at the Office of the President Jan. 11 in Taipei City. At this critical juncture, Su, who previously served as premier from 2006 to 2007, is the right candidate to assume the position given his abundant executive experience, strong resolve and lifelong devotion to public service, Tsai said. According to the president, Taiwan will face significant challenges in 2019 such as the fallout from the U.S.-China trade war and Beijing’s continued attempts to belittle the nation. Su has the leadership skills and determination to spearhead government efforts in boosting the local economy, defending democracy and safeguarding national sovereignty, she added. The appointment of Su followed the resignation of Lai alongside the rest of the Cabinet ahead of a reshuffle. In addition to premier, Su was formerly magistrate of southern Taiwan's Pingtung County from 1989 to 1993, magistrate of Taipei County, now New Taipei City, from 1997 to 2004, and secretary-general of the Office of the President from 2004 to 2005. Su thanked the president for her trust and the opportunity to serve the country once again. He pledged to do his outmost to continue the program of reforms enacted by Lai and respond to the will of the people. The president also extended her appreciation to Lai, praising his efforts to advance major policies such as the five-plus-two industrial innovation initiative and Forward-looking Infrastructure Development Program. Lai implemented wide-ranging reforms to enhance government efficiency and improve the nation’s business environment, Tsai said, adding that the development plans he crafted for Taiwan will help keep the country on the growth track.